She follows the ritual with the precision of a disciple such care taken to make everything perfect. Absinthe, spoon, sugar, flame-glowing blue caramelizing sugar, water sizzling over sugar dripping down. Perfection. Godlike. This is the pathway. This is the key. Unlock the secret. Be one with the queen of the muse, the green fairy and know the secrets of the universe. To see, to hear, to feel, to touch the face of God and become one with the universe. The fiery liquid burned her throat, into her body, into her blood, expanding. Green tendrils moving through her body, taking root, becoming one with her. She is becoming one with the universe. 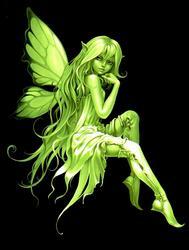 The Green Fairy stands before her a thousand shades of green, the color of life. Her glowing lime hair blowing in the breeze that caresses Christine’s skin. Eyes of emerald, skin of pale jade, slender fingers beckoning Christine forward to worship at the feet of the goddess. Arms wrap around her soft as summer clouds. Enveloping her, touching her tingling skin. Warm sweet breath. Fingers dancing like a master pianist playing every part of her body. The nape of her neck, her throat, her cheeks, flowing through her dark auburn hair. She can feel the essence of the fairy seeping into her invading every pore, overwhelming her senses. She is consumed. Mentally, physically, spiritually. Burning passion wells within her screaming to get out, to show the world all the things she can see, and hear and feel. To share all of this and more with the world. She will be the greatest artist who ever lived. She will be worshiped. She will be as a goddess herself. The canvass, her paints calling out to her waiting to be touched by the fire of God. She will create art like no one before her ever has, ever could. She will paint the face of god, the meaning of the universe. She will be worshiped and she will live forever in the heart of the green fire that is now hers to command. She stood before the blank canvass, electric green fire surging through her veins, igniting her blood. The thoughts in her mind super-charged. Images flashing across her mind’s eye, cinema verte, knowledge beyond comprehension, size beyond definable dimensions-infinite. All seeing, all knowing, history of the universe from the birth of creation to the final death of the last lonely god passing out of existence on the far, dark side of eternity. The ideas flowed through her, senses sucking in stimuli like a living black hole, images filtered through mind to muscle, tendons, ligaments stretched to capacity, fingers flickering firefly bright. Brush dancing an emerald ballet sweet song of chartreuse dreams. The canvass surrendered to her will. Warped and shaped in ways no mortal mind could know without the magic, the sensual bliss of La Fee Verte, her demon lover, her twin, her soul mate. Her soul exploded, a thousand suns gone super nova in the shadow of their love making. Two entities outside the bounds of time and space becoming one and in that moment creating the masterpiece that would change the world forever. She looked at the portrait of her mother and Father the hung in the studio, and thought of their putrid flesh rotting in anonymous, forgotten and abandoned by all. They had given all to their art and for what? Now they were food for the worms and no one remembered. Christine would not know their fate. This painting, this masterpiece was the proof of it. She would be worshiped. She would be remembered long after her corpse was crumbled to dust. Her soul, her art would be immortal. Christine Marlowe stands before her masterpiece and awaits the judgement of her Patron, Henri Duvall. Duvall shaking his head saddly, what must have become of this promising young girl that she whould put this… travesty in front of him. The look of shock on her face worried Duvall. This was no joke she actually believed this disaster had some kind of value, some kind of higher meaning. He felt very sorry for her. She had such promise. Christine wandered the cobblestone streets, mists from the near by waters caressing her, the gaslights burning like miniature suns in the fog. The man was a fool not to see what she had created, the greatness of it, the sheer importance of her work, but somehow she must appease him. Only through him, fool or not could her work be seen and recognized for what it truly was. She must find a way to satisfy this heretic, this ignorant heathen who stood between her and her waiting godhead. More absinthe, that was the key, it had always been the key; the doorway to her lost love. La Fee Verte would show her the way. La Fee Verte would show her everything. She longed so for her touch. Her velvet green caresses, soft and sleek across her skin. The arousal was overwhelming. She must know her lovers touch again. Christine sat in the darken corner of ‘The Sleeping Dragon’. It was said that the proprietors mixed their absinthe with laudanum and other ingredients to increase the effects, and enhance its spiritual powers. She must move beyond the mundane and ordinary if she was to attain her goal. That which was readily available to the masses would simple not do. She needed more, much more. She offered herself to the green fairy as no other. Give of herself body and soul if that was the price of remembrance, of godhood. No price could be too high. Everything and everyone were subject to sacrifice in her holy endeavor. The absinthe scorched her throat and set her, near empty stomach ablaze with holy fire. She could feel La Fee Verte at the edge of her mind, clawing through the veil of this mundane existence tearing gaping holes in the fabric of common reality and flooding her with wisdom and insight not know in this world since the characters of the Bible walked the earth. Her eyes shone with green fire, her skin bleed green sweat and her blood flowed with the essence of the goddess of the muse. Once again the goddess was upon her, inside her, ravishing her, partaking of her flesh and blood, consuming all her vital fluids and replacing them with the very essence of creation itself. To feel this, to know this sensation. It was the most holy of experiences, beyond all other earthly things. She was like no other living being in the history witness to, participant in the becoming of a god. The angels in heaven themselves must be weeping green tears of envy. It was her friend Michelle Benoit, who found her, lying in the cellar of ‘The Sleeping Dragon’. She had been missing for days. Her mind was a wash with fresh inspiration and yet she could not find her way out of the shadowy maze of the cellar in order to return to her studio and continue her work. This minor inconvenience would be corrected now that Michelle was here. Michelle stared at her friend, dress covered in dust and dirt and god knew what else. Her hair looked as though it were the home of a dozen rats or worse. Her skin was the color of spoiled meat and her smell was hardly better, and she could think only of returning to work. The situation was far, far worse than Duvall had imagined and for the first time Michelle feared for the very life of her friend. Her sanity might already be in question. “Home? Work? You must be joking. You’ll be lucky to avoid the hospital if you keep this up, and what was that…thing you gave to Duvall. My God Christine, that thing was a monstrosity. You’re lucky he didn’t have done with you the moment you placed it within his sight.” Christine registered little or nothing of what her friend was saying. She knew only that the blood of the fairy burned within her and was screaming to get out, to be seen, to be known. She must get home to her studio. Canvass was out of the question. Art of this caliber could not be held by a mere canvass. Art of this magnitude required something more, something much more. That was why the painting had failed, so great an achievement could not be placed in such an ordinary form. Extraordinary art must by its nature demand an extraordinary form. To home, to work, to immortality. Christine paced about in her studio considering and rejecting dozens of different possibilities. She had seen the secrets of the universe and now she MUST find a way to put what she had seen and experienced into her art. If she could not it had all been for nothing. What good did it do to touch the hand of god if no one ever acknowledged you for it? She was after all an artist and it was her duty to convey what she knew to her audience, to enlighten the world. To be remembered and worshiped for the master that she had become. She glanced around the room dozens of empty Absinthe bottles filled the room; there must be a full bottle among them somewhere. She must taste the kiss of the Green Fairy, only through her and her love could she find her way. She yearned for the touch of pale green hands on her breasts, her thighs, washing over her like the olive tide of the ocean. She found a half-full bottle near the window and drank deeply from the open neck. She no longer bothered with the rituals. The ritual had only been an introduction to her emerald lover. They no longer needed such things, now they where as one and would make passionate love on the shores of cobalt green seas. Master and apprentice, the loving touch of the fairy would teach her all that she would ever need to know. She would in her turn teach the world and for that they would worship at her feet. Christine sank to the floor, the empty bottle slipping from her fingers as her mind, synapses sizzling with emerald fire, sought the green fairy. She could feel the world receding, growing smaller, a shrinking blue-green sphere. She held the earth in the palm of her hand and offered it up to her waiting lover, glowing in the ethereal heavens. La Fee Verte took Christine’s pale alabaster hand in her own. The world was gone as if it had never truly been and this was the only true reality. Below her, in the gardens off Lafayette Street she could see a young waif of a girl. Dirty and wrinkled like an unmade bed she wandered the street like a wraith begging for…what? Food, shelter, a warm room and a bath. Christine would give her that. She would give her that and so very much more. Christine would show her the face of god. She was after all a demi-god and deserving of an acolyte. The dirty little wisp of a girl would be her new medium and through her Christine would bring the shining green light of life and knowledge to a world wallowing in ignorant darkness. The young girl’s name was Tara. An immigrant from Ireland. Perfect. She would be the canvass on which Christine would display the meaning of life and of the universe itself. Michelle found them the next morning. Christine passed out amid the empty bottles. Tara sprawled across the bed broken and bleeding every inch of her skin coated in green paint. The paint may or may not have been toxic. It hardly mattered; she had died a painful death by suffocation many hours ago, her blackened tongue hung from her mouth. Her pretty young face twisted into an agonizing grimace. “My masterpiece,” Christine replied with a smile. “Isn’t she wonderful?” “You did this,” Michelle gasped. “Nothing,” Christine rage rising up and gesticulating wildly. “ I have given her everything. I have given the world the soul of a goddess and you call it nothing. You are a heretic and you should be burned for such blasphemy. Life is nothing! Life is a drop of water in the ocean, a grain of sand in the desert. It means nothing. Death is eternal. REMEMBRACE is eternal. Nothing else matters Nothing.” Christine ranted. Michelle stared at her, her skin crawled and she could smell the insanity rolling of her friends in waves. There was no saving her now. Christine managed to avoid the hangman noose, barely. What she had done to poor young Tara in the middle of the night had been considered something no person in his or her right mind could conceive. In the end it was the heinousness of the killing that hand saved her. She stared at the pale green walls of the asylum and wept for the loss of La Fee Verte.